As a massive curry fan I wanted to create another original recipe using local ingredients. As everyone knows chicken and lamb both work well in curry but we wanted to create a dish that was extra special using something different. Enter Broughgammon farm! 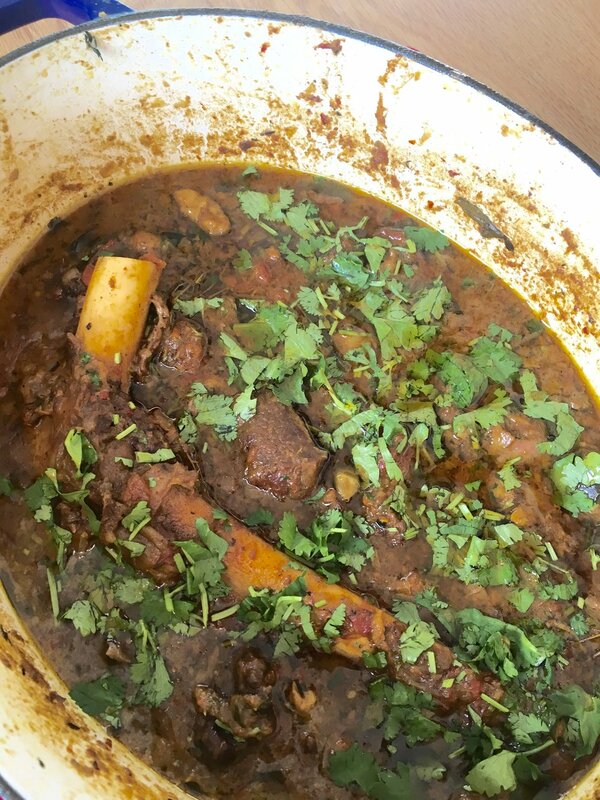 We have been wanting to cook a goat curry for some time, as to my surprise I read that it was the worlds most widely consumed meat so we went about sourcing some with the stipulation that it had to be from these shores. Thankfully through the world of social media that wasn't too hard. Broughgammon are a company located in Ballycastle who produce rose veal, kid goat and seasonal wild game. 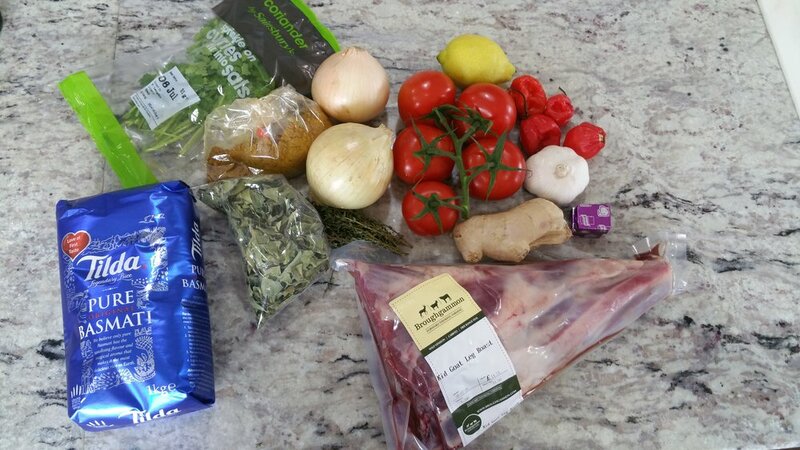 The majority of the ingredients including the goat were bought at St Georges Market. First thing to do is to prep your vegetables and bone out the Goat leg and chop into cubes. If you aren't confident in doing this just ask your butcher. (I used a food processor to blitz the garlic, chillies and ginger). Next step is to put a large pan onto a high heat, add your oil and fry the diced meat until brown. Take the meat out of the pan, place in a bowl and set aside. Turn down the heat to medium and in the same sauce pan add the butter, then add your garlic, chilli and ginger paste. Cook this for a few minutes until it starts to take on a golden colour. To this add your onions and thyme and cook for 10 minutes until they have sweated down and taken on a really nice colour. It is important that the heat is not too high as you don't want the butter or the veg to burn. We are not looking for blackened onions at this stage! Now put the meat back into the pot with the bone, add your garam masala, cardamon, chilli powder, curry leaves, tomatoes, coconut milk and stir. Don't forget the bone as this will add more flavour than any shop bought stock pot. Crumble in the stock cubes, top this up with water so it just covers well then put the lid on. Bring to the boil then reduce the heat and simmer for 3 hours stirring occasionally. I removed the lid for the last hour so the sauce had a lovely thick consistency. I then added the stalks from the of coriander to give the dish that extra bit of freshness (it really makes a difference). Cooking Rice is not one of my strong areas and I think people who say they follow the packet instructions, it turns out nice and fluffy and not stuck to the pan are telling lies! So this is how I cooked mine. To a large pan I added a tin of coconut milk, 2 whole scotch bonnet chillies , salt and a few sprigs of thyme, I then added 750 ml of water and brought it all to the boil. Once boiling I reduced the heat slightly and added my rice, cooked it for 10 minutes until just tender and no more. I then drained it and took the Chilli and thyme out. I tipped it back into the pot and let it stand for a few minutes to fluff up. I served this with a simple shop bought garlic naan and garnished with coriander. The Broughgammon kid leg made all the difference and added a sweetness that isn't as prominent with lamb. If you aren't a fan of Gamey meats don't be alarmed as the kid goat, being well a kid, didn't have time to develop that particular taste found in older goats. The scotch bonnet Chillies although intensely hot also provided an initial sweetness to the dish but when cooked for a lengthy period of time they also provide a fruity element with the heat slowly developing after at the back of the mouth.